Waqar Younis, the Pakistan coach, believes that the ongoing tour of England, which also includes Tests against Australia, will be a "learning tour" for his young side. Pakistan have begun the tour positively by beating Australia in two Twenty20 internationals and will hope for similar results in the five-day format. 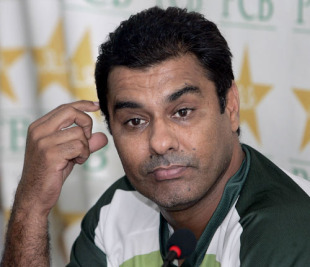 "We have a very young but exciting side and I think they are really looking forward to these Test matches," Waqar said. "Both these nations are playing superb cricket at the moment. Australia are world-beaters on their day and England are improving every day. So it is a tough tour for the youngsters, but also a learning tour for them. In many ways, it is like a restart for Pakistan." Pakistan are playing their 'home' series against Australia in England because of the security problems in Pakistan but they had vociferous support in Birmingham, the venue for the two Twenty20s. "We have not played cricket in Pakistan for a long time but we played at Birmingham in the Twenty20 match the other day and had great support," Waqar said. "If we get something like that at Lord's and Headingley it would be great. It is almost like a home from home. We are not really short of the backing here. It is just that we have got to play to our potential. "It is sad not to be playing in Pakistan because we have eight or nine beautiful stadiums. It's a shame and it's sad, but that's the way it is. You can't do anything at the moment and we've got to take what's being given." Pakistan's two-Test series against Australia begins at Lord's on Tuesday and it will be followed immediately by a four-Test series against England. "It is a very hectic schedule and there will not be much of a breather," Waqar said, but added that his side was up for the challenge.